The Port of Savannah’s Garden City Terminal is already the South Atlantic region’s busiest intermodal gateway, handling 38 trains per week of import and export cargo. 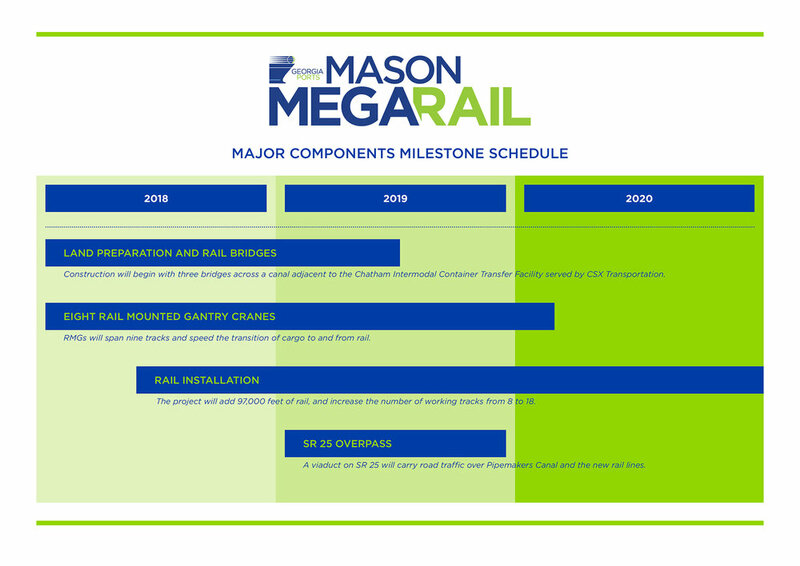 The Mason Mega Rail project will deliver the largest on-dock intermodal rail facility for a port authority in North America. The new rail infrastructure is part of a comprehensive expansion plan that includes a deeper harbor, the largest ship-to-shore crane fleet of any U.S. terminal, adding 60 rubber-tired gantry yard cranes and expanding truck gates. The Mason Mega Rail Terminal is the next step in the Port of Savannah’s drive to handle more cargo from Neo-Panamax vessels. It is part of a comprehensive expansion plan that includes a deeper harbor, the largest ship-to-shore crane fleet in North America, adding 60 RTG yard cranes and expanding truck gates. Of Savannah’s 36 weekly vessel calls, 10 are “first-in” services that call Garden City Terminal before other East Coast ports. Cargo owners that ship to Savannah can have their goods delivered by rail to markets such as Chicago before those containers might be offloaded from vessels at ports farther up the coast.